Is it just me, but isn’t KISStory a sweet science? The band’s appearance on the coming cover of Rolling Stone is the proverbial KISSKoupDeGras and figures more more prominently is rock history than their induction next month into the so called Rock & Roll Hall of Fame. Both have taken 40 years to happen. Madness. But, oh how the might have fallen … to have to acknowledge KISS? Not Eddie Murphy again on the cover? really? See, RStone and the RHall are one in the same and their but all-out capitulation is the proof today that both need KISS more than the band needs them. Anyway, all three entities sold out a long time ago or wouldn’t be here now in this stare down to see who blinks first. As KISS is prone to tell you, they’ve won yet again. Rome has fallen, the Berlin Wall has crumbled, the emperor has no pants, let the pagan hedonists rule!. The death of print media aside, history of all sorts teaches us that eventually the leaders of last revolution become the old guard and, resting on their laurels in desperate need of a way to distinguish themselves from commoners, ultimately want to tell everyone else what to think … when they finally do compromise it’s usually too late; the die is cast. The wicked witch of the west is dead at last, the KISS Army sleeps well tonight. 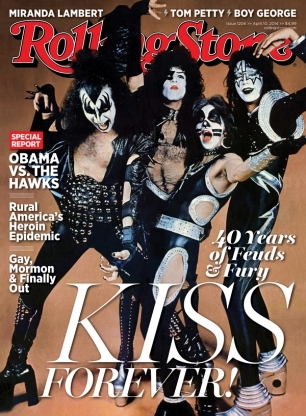 And as some sorta silly little consolation, and as a last jab at Gene & Paul by the RockHall clan, the mag finally allows Kiss to grace their already shrunken cover and of course chooses a rare photo of the long-gone original line-up …..whatchoo gonna do with folks like that?